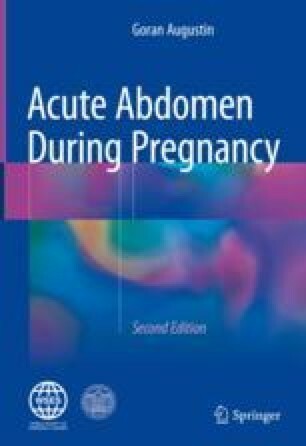 Adnexal torsion is one of the most common nonobstetric, but gynecologic, acute abdominal conditions in pregnancy. Due to the growing uterus, adnexa are pushed from pelvic to an abdominal position making them more prone to torsion. Today, with more widespread use of assisted reproductive technologies that result in ovarian hyperstimulation syndrome, adnexal torsion is even more common. Due to the often nonspecific clinical presentation, differential diagnosis is wide with some differential diagnoses that are side-specific. Sonography has high sensitivity and specificity for the diagnosis, and abdominal MRI is used in unequivocal cases. The treatment is operative. An additional reason for early operative detorsion is ovarian salvage in early pregnancy which hormonal role is important for the normal advancement of pregnancy.